What is an Iowa Quit Claim Deed? 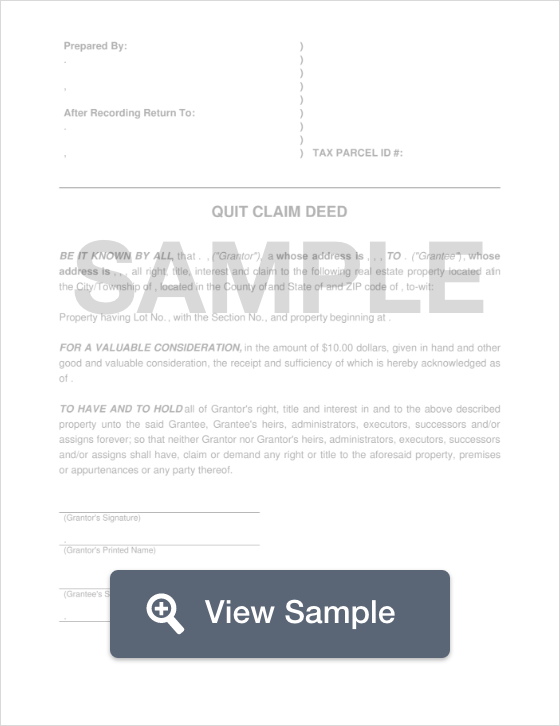 Iowa Quit Claim Deed: What Is It? A quit claim deed is an expeditious way to transfer the interest of a property from the seller to the buyer. It is important to note that a quit claim deed doesn’t guarantee that the title of a property is clear of any encumbrances. The document doesn't even guarantee the buyer that the seller has the legal authority to sell the property. However, what a quit claim deed does is ensure that the seller does not come back at a later date to claim an interest on the property. This form is generally used between family members but can be used for any type of property sale. As always, it is highly recommended that the buyer conduct a thorough title search to ensure that the title of the property they are purchasing or being transferred is clear. Signing - This document must be signed by the seller in the presence of a Notary Public, receiving an official seal of notarization (§ 558.31). Additional Paperwork - In Iowa, all quit claim deeds must include a Groundwater Hazard Statement along with a Declaration of Value form filed with the County Recorder’s Office. Recording - All quit claim deeds must be filed with the appropriate County Recorder’s Office.